Airbrush Tattoo Stencils, Tribal Stencils and Free Stencils! Airbrush Tattoo Stencils allow us to flaunt our body art for special events but avoid permanent markings. They’re fun for all ages too! Stencils are usually related to arts and crafts but in reality can be applied in so many other ways and appeal to a large variety of tastes and interests. 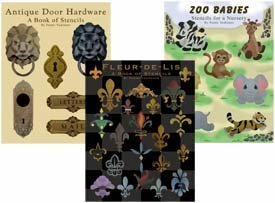 At All-About-Stencils, we try to accommodate all needs for stencil designs. Below are five free printable stencils, some ideas about using them and a video. Plus click on any of the stencils to get more like it! Using airbrush tattoo stencils is the best way to get an image in place with clean lines. Not only do they give you the best chance of a fool proof design over hand painting they also save loads of time. It’s up to you if you want to add more details after you remove the stencil. In the video below you’ll see how two colors were used with one stencil. Just to plant a few ideas in your imagination. When we talk about time saving, that’s important because I know some of you have started a business with air brushed stenciling. It’s great for parties, festivals, sports events... anytime there are a gathering of people. And it’s great for all ages which is why you’ll see such a wide variety of airbrush stencils on this page. Find more like this one at Rose Stencil! The easiest and quickest method of making one of these free stencils an adhesive backed airbrush tattoo stencil is to print on full page labels with a sticky back. Make sure to read all packaging and make sure that the product is safe for this application. The benefit of using adhesive airbrush tattoo stencils is that you have two free hands to apply more detail to your temporary tattoos with little to no mess at all. Plus, because the sticky back hugs the skin, you’ll get much cleaner and sharper lines with no bleeding under the stencil. The lizard is from Southwestern Stencils where you can find a coyote and moon, a cactus and a horned skull. These free stencils to print can be just like mylar or plastic stencils (except of course they’re free!). After printing the stencil on paper and before you cut out the design, cover it with a clear protective coating like clear shelf liner or strips of clear packing tape with each row slightly overlapping the previous. Actually, because these airbrush tattoo stencils are paper thin, they tend to be easier to work with than plastic stencils which are not as flexible. The downside of this kind of stencil is that because you have to hold it, you're limited to using one color and they are more prone to have paint bleeding underneath the stencil or shadow lines if the person moves as you are applying the tattoo. 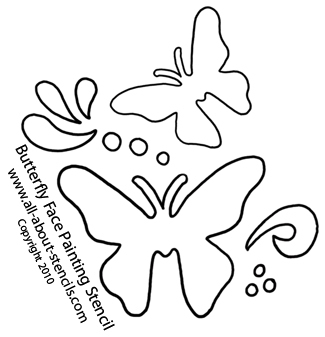 The butterfly stencils are part of the face painting stencils. If the butterflies are your tastes, there's a heart bouquet that you'll love! As I said above, the goal here was to satisfy any ideas of airbrush tattoo stencils. But, the page is only so long and five stencils were pushing it. No problem! 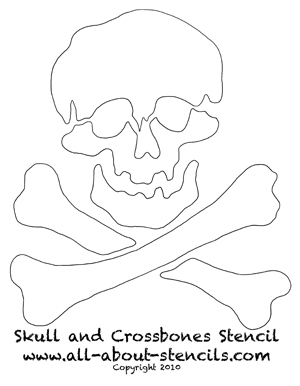 There are many more free stencils perfect for the application as airbrush tattoo stencils. First try some of the free stenciling patterns listed in the right column. 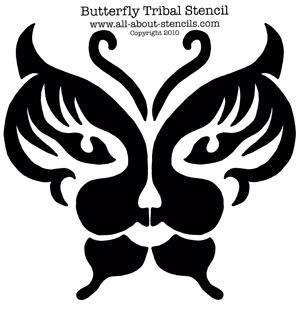 This butterfly stencil is from our Tribal Stencils. It’s design is more suitable to girls and ladies but here you’ll find a dragon stencil which is great for the guys! Of course, you need to check out the body stencils which has a number of links to appropriate airbrush tattoo stencils. Don’t miss the graffiti art stencils and I think you’ll get some use from the guitar stencils. Don’t stop there - this site is loaded with freebies! To learn more about working with these stencils go to Air Brushed Stenciling where you’ll find a collection of great videos that will step you through the process of working with airbrush stencils. And keep scrolling down this page for a great video which features using an adhesive backed stencil. Here's the video I promised you! Return to Home Page from Airbrush Tattoo Stencils. Return to Airbrush Stencils from Airbrush Tattoo Stencils.